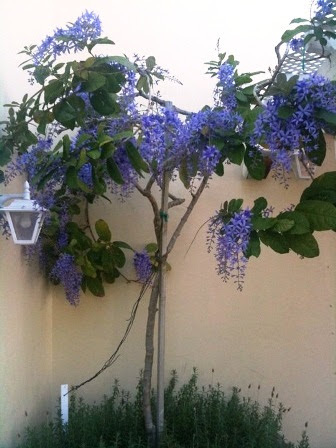 When we bought our Sandpaper Vine (Petrea Volubilis), I already had an image of it when it matures and flowers. Of course, I didn't have an exact timetable for that. But I was thinking it would be around two years. 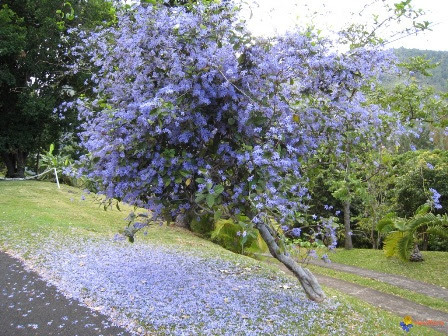 What I envisioned would be a flowering vine that more or less resembled a small tree. It would have a main trunk that will be as vertically straight as possible. Or the trunk may be composed of a couple of very thick branches probably entwined to one another. 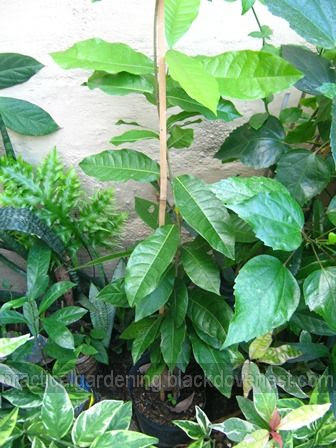 I've already had success in growing a Rangoon Creeper vine (Quisqualis indica) that was trained to grow this way. This time though, I would attempt to grow a single branch that would become the trunk of the Sandpaper vine. After all, some people have been successful in letting the vine grow with just one main branch as the trunk as the photo below shows. Here's one that isn't vertical and looks like it has another branch tightly wound to the main branch. I'm guessing strong winds almost toppled this to the ground and that is why it is heavily tilted to one side. Notice how massive those branches at the trunk have become. Here is the small Sandpaper vine that we bought. The leaves are large and lush. It is still in its black soft pot. I stuck a temporary bamboo stake inside the soft pot just to keep the Sandpaper vine from drooping. This is the spot where I will be planting it in the ground. This location is directly under a vine structure I built a few years ago. The vine structure or trellis formerly housed the Mysore Clock vine (Thunbergia mysorensis) that I kept for three years. I decided to take down the Thunbergia mysorensis because it was too invasive and high maintenance for me. It grew thick very quickly and I had to prune it frequently. The vine structure is a consideration for the Sandpaper vine's location because of the vine's tendency to shoot out multiple branches. I'm able to keep the trunk fairly clear of adventitious buds that may develop wayward branches. But the canopy of the vine is where I will allow branches to grow, flourish and flower. For that, the vine would need some sort of support for its canopy. After two months, the Sandpaper vine was ready for planting in-ground. It has developed new shoots and was ready to climb. Here is the Sandpaper vine as planted. 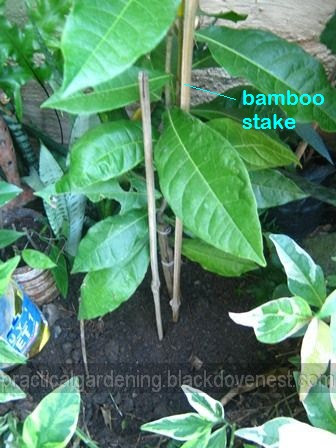 I continued to use the bamboo stake to prop up the plant. Do not mind the other bamboo stake at the left. For some reasons, I just forgot to take it out for the photo. Notice that at the base of the plant, there are a couple of short flat and thin bamboo sticks that are tied. These bamboo sticks function as splints and compress the trunk to correct bends or crookedness. Here is a detailed view of the base of the Sandpaper vine showing the bamboo splints. 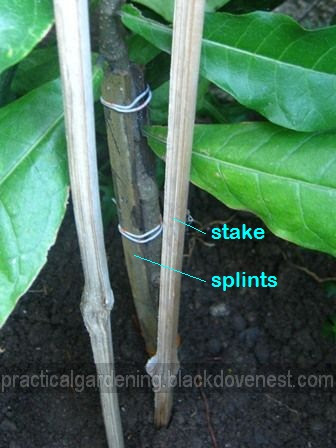 To learn how to apply splints on a branch, refer to my article, Straighten the Bent Trunk or Branch of a Garden Plant.